At the recent WW1 Activity Day held recently at Bottesford CE Primary School, Emma Barker, one of the teachers, told David Middleton the story of her father’s discovery of his grandfather’s service in the 1st World War. She agreed to ask her father, Steve Sordy, to write a short piece about her great grandfather’s wartime service, and a little of the life he led after he was demobilised. 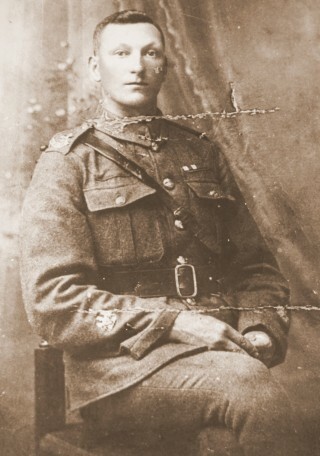 He was RSM Thomas Sordy of the Durham Light Infantry, an ordinary chap from Gateshead who joined up in 1910 and then rose through the ranks to be Company Sergeant Major and then Regimental Sergeant Major, receiving the Croix de Guerre, the Military Cross and the Military Cross Bar during his WW1 service. Steve Sordy also talks about the equally distinguished career of Captain Bousfield of the Durham Light Infantry, whose grand-children by an amazing coincidence found themselves living next to Thomas Sordy’s grandchildren many years later. I never knew my grandfather Thomas Sordy; he died when my father William was only eight years old. I didn’t know my grandmother Katherine either; she died when my father was only three years old! Times were hard in Gateshead for a child born in 1926. Fortunately, Thomas and Katherine had five older children, three girls and two boys who were able to take care of my father. Unlike their parents, they survived long enough for me to know them all. They were able to pass on a few sepia-toned photographs and could relate fragments of the story of my grandfather and his medals. 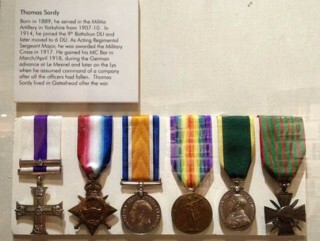 Thomas Sordy was a Regimental Sergeant Major, the most senior non-commissioned officer in the Regiment. The RSM is chosen because he exemplifies the spirit and character of the Regiment, an example to all. How I wish that I had known him! Earlier this year, my wife and I went to the Museum of the Durham Light Infantry (DLI) to get some more background on my grandfather and to see for the first time the medals that had been gifted to the regiment many years before. I was amazed to find that he had a special display, along with hundreds of other soldiers that had distinguished service in the DLI. I had half expected to find just a few lines in a dusty old book! I don’t know how he won his first MC, nor exactly what he did to gain the French Croix de Guerre. The Croix de Guerre is awarded to individuals who distinguish themselves by acts of heroism involving combat with enemy forces. The MC and bar is the medal on the left and the CdG is the medal on the right. The awards in between are four medals for campaigns and meritorious service. But I do know what he did to win his second Military Cross. A company of men were charged with crossing the River Lys. The crossing was resisted and all the officers were killed. RSM Thomas Sordy (he was Acting RSM at the time) took command and the crossing was completed. The Lys crossing became one of the Regiments battle honours, signified by the banner containing the word “Lys” sewn onto the Regiment’s flag. This distinguished soldier was demobbed at the end of the war, aged 29. The only work he could find was in the mines. Not a good occupation for a man who had been gassed! The injuries suffered during his service, no doubt assisted by the dust inhaled in the mines, led to his early death at the age of 45 in 1934. When I reflect upon this man, who I never had a chance to meet, I think about the hard life he led, his triumphs and most of all his undoubted and recognised outstanding character. For such a man to end his life coughing his lungs out, bereaved and in poverty! The thought brings tears to my eyes. Whilst we were reading the citation on the display and examining the medals, we couldn’t help but notice the display right next to it. The reason we noticed, was the name – Frederick Bousfield. For more than 25 years until they moved away, a family called Bousfield had lived next door to us, Fred and Elsie and their four sons. Just in case there was a connection, we took a photograph and checked with Elsie when we got home. Her husband Fred had long since passed, but Elsie confirmed that Captain Frederick Bousfield was indeed her father-in-law! As Frederick and Thomas both served in the 9th DLI at the same time, it is entirely possible that they knew each other. To think that their grandchildren should end up living next door to each other a century later in a village 160 miles away really does push the laws of chance. I don’t know why Bousfield was next to Sordy in the display. We could see no obvious order to the sequence, maybe it was deliberately random to convey the randomness of who lived and who died in that awful conflict. I failed to get an answer from the museum at the time. 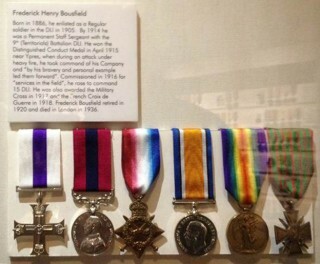 For completeness, here is Captain Frederick Bousfield’s display and citation. The Military Cross is on the left, the Distinguished Conduct Medal to its right, the French Croix de Guerre on the extreme right, with three medals for campaigns and meritorious service in between. These were just two brave and distinguished soldiers among the many that served their country in a time of need. It is good to know that we still have such people to call upon in present times. On 20th February 2018, Elsie Bousfield passed away aged 91. In the days that followed I was invited to speak at her funeral service. I knew that none of Elsie’s family knew about the link between our families and so I decided to mention it as part of my address. A few days before the service, I mentioned the link to one of Elsie’s sons and he told me that he believed that Captain Frederick Henry Bousfield was not his grandfather! Yikes! Just in case Captain FH Bousfield was a member of his family that he was unaware of, he forwarded a copy of the display to his aunt who is the family archivist. She confirmed that if Captain FH Bousfield was a relative, he was so distant that she was unaware of it. Oh dear, the real father in law, David William Bousfield, also served in the DLI and died in London, so I can understand how an 87-year old woman might see what she wanted to see. 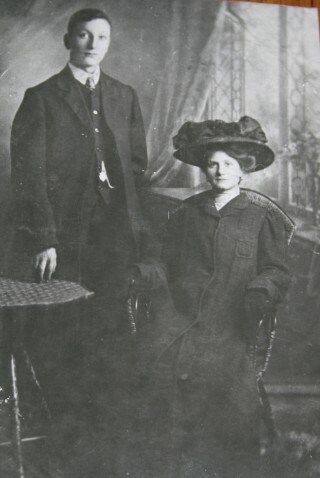 But David William Bousfield was invalided out of the army quite early on and lived for 30 more years than did Captain Frederick Henry Bousfield. I found myself in a difficult position. Members of two separate Bousfield families had an incorrect entry on this website, and indirectly, I put it there! My sincere apologies for this error, but I hope you can understand how it happened; I was misinformed by a normally extremely reliable individual. I did not want to just remove Captain FH Bousfield’s entry and pretend that no error had occurred, as that seemed disrespectful. I hope that this correction will put things right. Frederick Henry Bousfield was my Grandfather. He died in Hammersmith, London, before I was born, but my Grandmother moved to Princes Risborough to be near her 3 sons. My grandmother was Freds second wife. His first wife was from Cork Ireland. Her name was Bridget. Small world. Steve, I came across this purely by chance and it’s absolutely fascinating. I suspect that my postscript dated 17th Apr’18 was added after Kathryn Bousfield made her comment on the 18th. Ref my query about the logic behind why RSM Sordy and Captain Bousfield were placed next to each other. I believe it was in the order of seniority of medals. Therefore the Victoria Cross holders would be grouped together and so forth. It would appear that if someone had two of a particular medal they were placed before someone with one medal.